The American Saddlebred is a breed that (like the name suggests) has its roots in America. In the late 18th century, colonists bred Narragansett Pacers (which were later also the base for the modern Standardbred) to the English Thoroughbreds. They called this new breed the American Horse, and later it became known as the Kentucky Saddler. Only later, in the 1830's it necame known as the American Saddlebred. The American Saddlebred was used on plantations, as it was a great fancy harness horse, but at the same time strong enough to do the hard work on the plantation. Later, to give the breed more substance and action, the Saddlebreds were crossed with Thoroughbreds and Morgans. It then looked somewhat like the breed we know today as the American Saddlrebred. Breed description: clean cut head, long elegant neck, lean body with a rather long back and long limbs, high set tail. The Saddlebred should show supple movement with high leg action. High head carriage is desirable especially in harness horses. 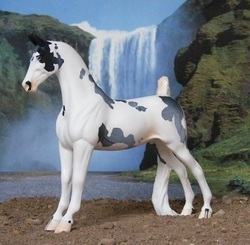 Any and all colours are acceptable, with the exception of Appaloosa. Height varies from 15 hh to 17 hh with most averaging 16 hh. Naming guidelines: No names which are conflicting or very similar to existing registered American Saddlebreds. The name may not exceed 35 characters, including letters, spaces and punctuation. We have horses of mostly Wing Commander, Valley View Supreme and Genius Bourbon King lineage, with also some very nice model bred lines as well.